"Immediately following the open house, we knew that PPA was the right choice for our daughter. Looking back after such a successful first year, I am so proud of her!" “I Love My Mommy Week” is next! 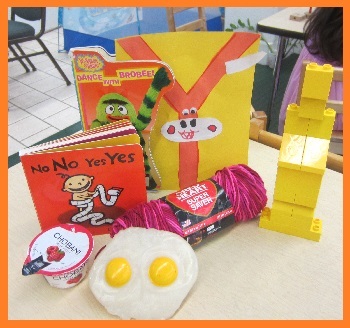 “Letter Y is for YummY Week” was Yerrific, Yonderful, Yantastic, Youtstanding, and of course quite YummY! Read on below to learn about the fun that was had and learning that took place! Shares in hand, the students arrived at school on Monday morning ready to get started! The letter Y shares were quite plentiful! From assorted yellow items to Younger “when I was a baby” photographs, the letter Y shares proved to be some of the most exciting shares yet! Some of the shares that came in did not only start with the letter Y, they were quite YummY as well! Several of the students even ate their shares at snacktime! Judging by how quickly these Yummy shares were gobbled up, it is safe to assume that they were YummmmmmY! Here are a few more Y shares! Monday and Tuesday mornings were spent completing Letter Y identification/writing/tracing activities throughout morning work and morning stations. The students spent their afternoons learning just how tricky the letter Y really is. Despite sounding like it should make the Letter W (“Wuh”) sound when it is said, the letter Y makes a sound that can often go undetected and in some cases like another letter – U! To an adult, the word “you” clearly starts with the letter Y but it sounds pretty tricky when you say and hear the sentence – “You starts with Y”. Even in the face of a tricky letter, the students were able to create a great list of Letter Y words. Also on Monday afternoon, the students were visited by a big brother (and graduate of PPA) whose name begins with Y! Speaking of Y, the visitor brought along his grandmother to teach to the students about their Greek family heritage – particularly the Greek letter Y word from Grandma – Yιαγιά (pronounced Ya-ya)! The students loved hearing the student and graduate photographed below call their Grandmother by such a fun letter Y name! After hearing a few stories, read by the graduate and the PPA student, the students were delighted to learned that the Mommy and Yιαγιά had prepared a Yummy Yogurt snack called Tzatziki for the students to try! What a YummY and lovely surprise! A special thank you to the student’s Mommy, student’s brother, and Yιαγιά for visiting us! 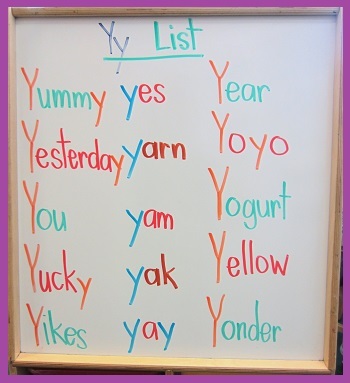 On Wednesday, the students blew the teachers away by brainstorming a list of Yummy Yellows – i.e. Food that is yummy and also yellow in color! Would you believe they came up with a list of over 30 yellow foods?!? Some of the Yummy Yellows included: Scrambled Eggs, Bananas, Cheese, Golden Apples, Pineapple, Corn, Squash, Yellow Peppers, Spaghetti, and more! Thinking outside of the box, one student even added “pollen” to the list noting that “Pollen is a Yummy Yellow for a Bumble Bee!” How clever! The Yummy Yellow excitement grew as the students learned they would be getting to taste and enjoy some of the Yummy Yellows themselves thanks to Miss Justine, who prepared a rather large selection of Yummy Yellows during rest time! While all of the yellows proved to be yummy, one really stood out to the students because of how funny it was to taste. Can you guess which Yummy Yellow caused the students to make these faces? If you said, “Lemon!” then you are correct! Take a look below to see more photographs from Wednesday’s Yummy Yellow Tasting! By Thursday, things were really “cooking” as the students began their YummY morning work activities! After asking the students which foods they found to be the Yummiest of all, the teachers realized that many of the foods the students had named were “sometimes” food. The teachers explained that “sometimes” food is food, like YummY ice cream, which is good to eat as long as it is eaten only sometimes. They explained that eating ice cream and other sweets everyday would not be a good choice because of what is inside it. This being said, the teachers decided to ask the students about things that are okay to eat anytime like fruits or vegetables. After taking a healthier approach with their YummY list, the students came up with great answers such as apples, bananas, corn, and carrots! Upon hearing the students’ responses, the teachers decided to make the remainder of YummY week all about discovering healthy YummY foods! On Thursday – Yummy Yogurt Parfaits complete with various Yummy toppings! On Friday – Yummy Cereal Snack-Mix comprised of raisins, pretzels, Multigrain Cheerios, and more! Also on Friday, the students were visited by a PPA Daddy who came in to read a story to the class! What a fun way to end the week! A special PPA “Thank You” to the Daddy and students photographed below. We hope you had as much fun with us as we did with you! Something else extra exciting happened on Friday! Several of the students’ butterflies had come out of their chrysalises! Since only three of nine butterflies were out and in the tent, the students and teachers decided to wait until after the weekend to set the all of butterflies free – together! Hopefully by the time the students are back in school on Monday, the butterflies will all be ready to go! Take a look below to see the latest “Caterpillar to Butterfly” developments! Well, that wraps up “Letter Y is for Yummy Week” but even though the week has come to a close, it does not mean that the Yumminess has to stop! Be sure to keep looking for new and different YummY foods to try out each day! In the wise words of Sam I Am, “You do not like them. So you say. Try them! Try them! And you may. Try them and you may, I say!” As always, thank you for reading! Have a fun and safe weekend! enrolling in the 2014 PPA Summer Camp! Next week, all Mommies will be asked to remain outside of the classroom during arrival time as PPA will transform into a Mother’s Day Factory full of goodies and surprises for Mommies! Daddies/Grandparents/Caregivers are welcome to come in during arrival to take a sneak peek if they wish!